As music students and astute music listeners know, the highest voice is generally the one that’s most evident. Almost all popular piano-voice pieces have, as a matter of course, the melody in the top of the right hand. Chords are generally filled by a few remaining fingers of the right hand. The left hand plays the bass and, occasionally will take over some of the harmony roles. Less frequently, an inner voice, if there is one that’s not just a coincidence of the harmonies, may be played by either hand. Orchestral writers use this tried and true method of getting the melody heard. Naturally, there’s a scientific reason for this, relating to the physics of sound, harmonics, and probably a handful of other causes. It has worked to great effect in the hands of composers from the beginnings writing individual parts for the orchestra. Putting the melody in the first violins, doubled perhaps an octave lower in the second violins, upper woodwinds, and brass is standard practice. Often it will have the horns, lower woodwinds, and trombones play some block chords (in a rhythmic pattern or sustained), and you’ve just done an orchestration. It will be functional, if bland, and has been and still is a standard method of orchestral writing. Fortunately, an orchestrator has additional tools available to highlight a voice, change or add color, and engage the listener. One very straightforward tool is simply telling the rest of the orchestra to play softly while one instrument, one section, or group of sections, plays the tune on which the composer wants the listener to focus. A brief example is in the Debussy Prelude to the Afternoon of a Faun (measures 51-52, ~4:30). In this example, the clarinet plays the melody in its chalumeau register with an off-the-beat rhythm, just above middle C. In case this is an unfamiliar term, the chalumeau register has been described as “warm” and even “throaty.” For a B-flat clarinet it’s around the F in the bottom space of the staff. So, the first and second violins are playing high, descending quarter notes while the bassoons, horns, and basses are sustaining a chord for the two measures. The solo clarinet is marked piano and doux et expressif (“softly – or sweetly – and expressively”). Note that the clarinet’s dynamic marking of piano is the loudest marking in the orchestra. All the other instruments are marked pianissimo. Then, in the second measure the three flutes play a chord that’s marked triple piano. It’s probably a good idea to mark it so softly because the chord is in the exact register as the clarinet for that measure. Like more than a few composers of the latter part of the Nineteenth Century, Debussy pushed boundaries in his scoring as well as his chromaticism. When a composer has a specific musician, small ensemble, or even an orchestra in mind, he or she may write the entire composition with that instrumentation. In the case of Ravel’s Pavane for a Dead Princess, the ensemble was a chamber orchestra with one oboe, pairs of flutes, clarinets, bassoons, and horns, plus a harp. There’s a short passage towards the very beginning of this endearing piece that has the oboe and bassoon playing two lines that are nearly inversions of one another, about an octave apart. The musical space between them is filled only with clarinet eighth-notes in thirds. The other sounds are from just the double basses sustaining whole notes and the harp assisting and adding a touch of a beat to support the clarinets. 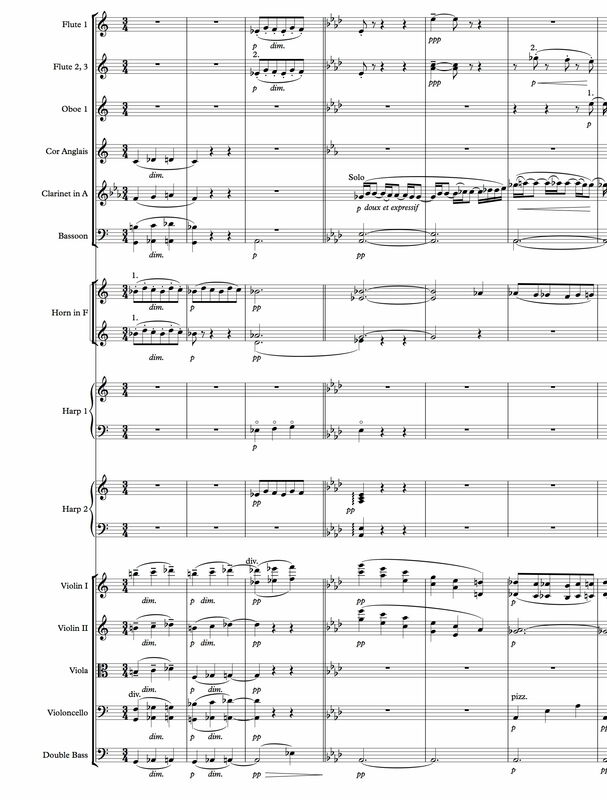 As the passage comes to an end, the winds open the harmonies up, the horns take over the clarinet eight-notes for one measure before adding to the wind ensemble and filling out the chords. One of the notable features of the passage is the complete absence of any strings other than the pedal bass. Note, too, that Ravel keeps the flutes out of the passage even when adding the horns. It seems as if he did not want the purity of the richness of the reed woodwinds to be denatured by the brightness of the flutes, even in their lowest and least bright register. 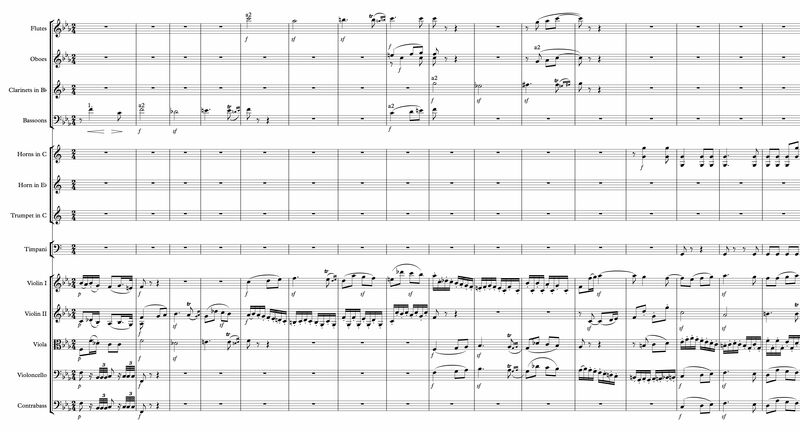 The ensuing passage is almost the same, but here Ravel gives us all the strings. This time there are no winds except for the first bassoon playing whole notes, supported on the primary chord changes with the pizzicato basses. There is a clarity of these melody lines that sings even with their “to be played very softly” markings. Ravel, both a brilliant composer and orchestrator, knew how to write with color and clarity, all the time keeping the listener’s attention and interest. No discussion of inner voices should omit the grandfather of “modern old fashioned” polyphonic works – yes, that’s a neoplasm – designed in their core to be voice-centric: fugues. Writing a fugue and making all the voices heard is not a simple task. That’s clearly an understatement. Fugues have always provided a enjoyable challenge to composers. A deceptively simple assignment, after reviewing the Bach two- and three-part inventions, might be to write a two-part invention that has the melodic appeal, beauty, clarity, timing-sense, and simplicity of the great Baroque genius. Written some fifty years after Bach’s demise, Beethoven’s stunning (for its time – and still today) third symphony has quite a few fugal sections, possibly paying homage to Bach. The one that particularly comes to mind for this discussion is the dramatic double fugue in the funeral march, that is, the second movement. 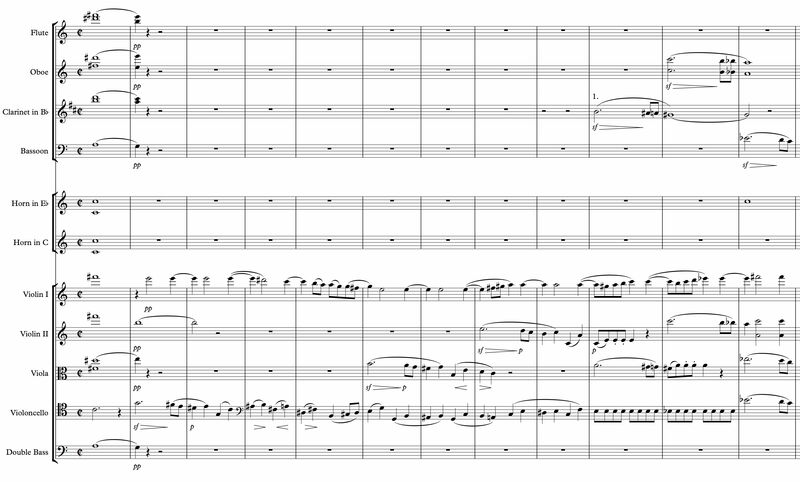 In addition to the standard strings, the movement uses double woodwinds, three horns, two trumpets, and timpani. Beethoven begins both melodies on the same note. The second violins play the more intricate one while the violas and bassoons play the more sustained one. Beethoven’s use of the violin’s tune, rising step wise from F to G to A-flat, immediately makes the listener know that something “different” is happening. When the F moves down to a D-flat in the second bar as the rising violas arrive at their B-flat, the ear realizes that there are two melodies being played concurrently. With nothing else happening in the rest of the orchestra for these opening three bars, it’s quite simple to keep the two voices straight. When the second violin’s theme is “answered” in bar four, up a fifth, as the flutes take over the second theme from the violas and bassoons, the fugue becomes more interesting tonally. Yet, with all the activity, there’s no problem for the listener following the voices. Beethoven may have been the rule-breaker (“ushering in the Romantic era in music,” it is said), but he was clearly knowledgeable in the ways of those who came before. As with any artist, one wonders what he or she might have done if a modern orchestra had been made available. Beethoven was one of the first composers to use piccolo, trombones, and contrabassoon in the symphonic canon. In discussing Ravel above and the subject of outstanding orchestrators, it would be beneficial to visit a man who wrote the book on the subject. (OK, he wrote one of the books.) Hector Berlioz is probably best remembered for his Symphonie fantastique, but his well-known works include Les Troyens, Harold en Italie, Roméo et Juliette, and L’enfance du Christ. It’s not that Berlioz is doing something unique in the example and it’s certainly much simpler than the Beethoven. Yet Berlioz’s use of subtle sforzandos on the downbeats of the measure as each voice enters shows how a craftsman works. Note that each string part is a different voice and how Berlioz builds from the cellos, to the violas, to the second violins. When the violas restate the brief melody (dotted half-note and two eighth notes followed by quarter notes) they are accompanied by one clarinet. Yet, in the next measure, when the second violins have their second entry they are accompanied by oboes in octaves. This helps to differentiate the second violins from the upward lines in the first violins moving through the same voice range. This very short fugato passage is easy to miss when listening to the entire work. It’s worth pointing out to see how Berlioz throws this little bagatelle into the massive and inventive symphony. Sometimes the easiest way to get an inner voice heard is simply to choose the right one and to introduce it in the right way. This is obviously not a viable alternative to every such dilemma, but there are times where the composer has the option. A wonderful example is in the final movement of Gustav Holst’s St. Paul’s Suite (for string orchestra). In this example the composer combines two traditional melodies, one fast and one slow, in such a way that both can be heard easily. The example is from measures 46 to 73. After introducing “The Irish Washerwoman” in the first violins at the top of the movement, Holst moves the melody around to the seconds and the violas, until it’s stated again in the firsts supplemented by the seconds with some thirds and sixth harmonies. As the arrangement becomes leaner with only the first violins playing the melody with more sustained harmonies from the rest of the ensemble, Holst introduces the traditional “Greensleeves” in the cellos. It appears to be a simple thing, but it’s worth noting that the violas take over the melody – now so familiar that it’s functioning primarily as the ensemble’s rhythm machine – quite close to the range where the cellos play “Greensleeves.” Holst seems comfortable with the singing cellos over sustained tones in the double basses, although he does add very soft string harmonic lines in this passage in the first violins and the violas. Similar to the horns, as mentioned above, the sustained strings helps the ear to “bind” all the elements. The string writing is clear and simple. Nevertheless, Holst makes use of these two traditional melodies such that most listeners find delight in their juxtaposition. During the period when Holst was writing this there was general interest in the folk melodies by the English. “Greensleeves” was the basis for a fantasia by Ralph Vaughan Williams in which the composer adds another traditional tune (“Seventeen Come Sunday”) to be the middle section of the work. For those interested, the works of Percy Grainger, Frederick Delius, John Ireland, Arnold Bax, and Malcolm Arnold as well as Vaughan Williams and Holst might be of interest. One of the many factors in orchestra writing is to ensure that what you want the audience to hear is heard – and in the way you want them to hear it. Sometimes this is by hitting the audience over the head with auxiliary instrumentation (Percussion always comes to mind). Sometimes it is accomplished by something as ephemeral as asking the strings to crescendo on a long downbow. Regardless of how it’s done, the orchestrator has many tools available to make the inner voices memorable. It may serve an orchestrator well to employ a full a palette of these tools to assist in making the orchestra sing.